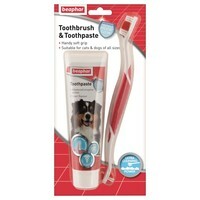 Beaphar Toothbrush & Toothpaste for Dogs is an easy to use and effective way to ensure that your dog has nice clean teeth, and fresh smelling breath, at all times. Containing a specially designed toothbrush and a great tasting toothpaste, this simple kit provides everything you need for your dog’s oral health. Not only beneficial for your pet’s overall health, but the process of regular cleaning is a great way to bond with them too!